lisa hlovate. 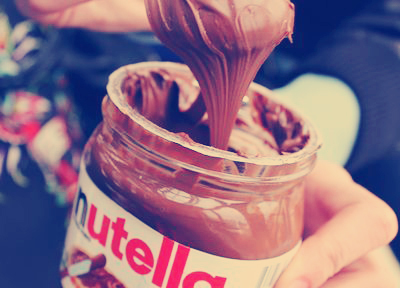 : The Power of Nutella.. oh nom nom.. yummy! Hai uolls... shokolate lavers.... who love nutella? raise up you hand!! 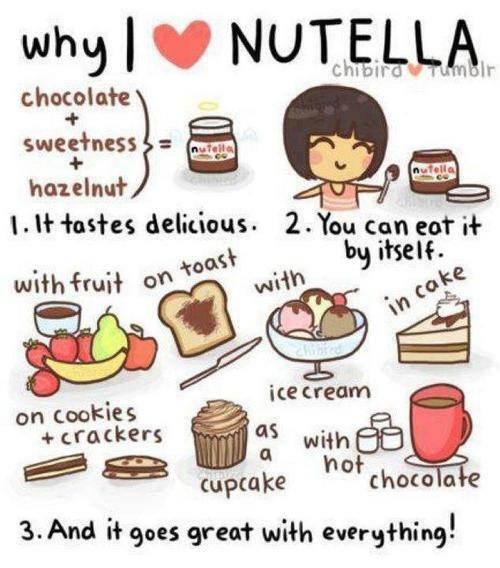 i love nuttela because it the only reason to buy bread...there's no end to the delicious possibilities you can have with the chocolate-hazelnut spread..There is Nuttela inspired treat you can find in Klang Valley and Penang!!! Where: Three Little Birds Coffee @ D7, Jalan Sentul, 51000 Kuala Lumpur. Monday to Thursday: 8.00AM to 11.00PM. Friday to Saturday: 8.00AM to 12.00AM. One of the most popular items in the menu, the 'mochatella' achieves its full-bodied potential when hot milk is poured over coffee cubes in a cup lined with a generous dollop of Nutella. 1. CoffeeSociété @ Publika, Block D4, Level G3, Unit 3A, Jalan Dutamas 1, Solaris Dutamas, 50480 Kuala Lumpur. 2. Garage 51 by CoffeeSociété @ 51, Jalan PJS 11/9, Bandar Sunway, 46150 Kuala Lumpur. 3. Underground Société @ 68, Jalan PJS 11/7, Bandar Sunway, 46150 Subang Jaya, Selangor. The Mochaccino Con La Nutella is mocha served in a cup heavily coated with Nutella. Just remember to check your teeth for sticky chocolate marks before walking out. 1. WHISK Espresso Bar + Bake Shop @ LG-3A, Empire Shopping Gallery, Jalan SS16/1, 47500 Petaling Jaya, Selangor. 2. WHISK, Outpost @ G139, Ground Floor, Old Wing, One Utama Shopping Centre, Lebuh Bandar Utama, Petaling Jaya, 47800. 2. Crave Cafe @ BG-03, Block B, Oasis Square, Jalan PJU 1A/7 Ara Damansara, 47301 Petaling Jaya. 3. TiPsy Brew O' Coffee @ C-07-G, Block C Setiawalk, Persiaran Wawasan, Pusat Bandar Puchong, 47160 Puchong. Saturday and Sunday from 8.00AM to 12.00AM. Friday and Saturday from 8.00AM to 11.00PM. Saturday and Sunday from 9.30AM to 11.00PM. 1. The Red Beanbag @ A4-1-08, Solaris Dutamas, Jalan Dutamas 1, 50480 Kuala Lumpur. 2. The Curious Goat @ No. 20-1, Jalan PJU 8/3A, Damansara Perdana, 47820 Petaling Jaya. Sunday from 9.30AM to 10.00PM. Sunday from 11.00AM to 10.00PM. Where: 33, Jalan Telawi 3, Bangsar, 59100 Kuala Lumpur. Where: Block C-LG-3, Garden Office Encorp The Strand, Jalan PJU 5/1, 47810 Kota Damansara, Selangor. Where: 36, Jalan Datuk Sulaiman, Taman Tun Dr Ismail, 60000 Kuala Lumpur. Opening Hours: Open daily from 8.00AM to 11.00PM. 1. Damansara Uptown: 61G & 61M, Jalan SS21/37 Damansara Utama, 47400 Petaling Jaya, Selangor. 2. IOI City Mall Putrajaya: Lot GE-15, Ground Floor, IOI City Mall Lebuh IRC, IOI Resort City 62502 Putrajaya, Sepang, Selangor. 3. D'Pulze Shopping Centre Cyberjaya: UG 18, Upper Ground Floor, D’Pulze Shopping Centre, Lingkaran Cyber Point Timur, Cyber 12, 63000 Sepang, Selangor. 1. Damansara Uptown: Monday to Thursday from 8.00AM to 11.00PM, Friday from 8.00AM to 1.00AM, Saturday from 10.00AM to 1.00AM, Sunday from 10.00AM to 11.00PM. 2. IOI City Mall Putrajaya: Daily from 10.00AM to 10.00PM. 3. D'Pulze Shopping Centre Cyberjaya: Daily from 10.00AM to 10.00PM. Where: The Pool @ 347, Jalan Ampang, 50400 Kuala Lumpur.